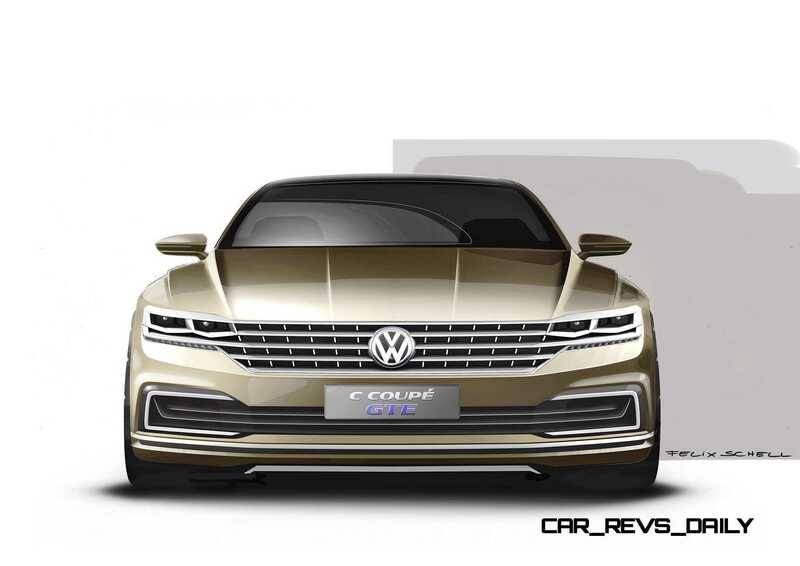 You probably know that Chinese car buyers love VWs and they love limousines. Seems like a perfect opportunity to combine the two into a stylish market-leader, right? Perhaps. 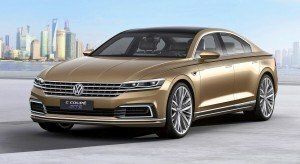 The VW Phaeton has indeed been a relatively big hit in China, which is the car’s leading/only market along with Germany. 2 — its engines are too large and draw massive VAT taxes. 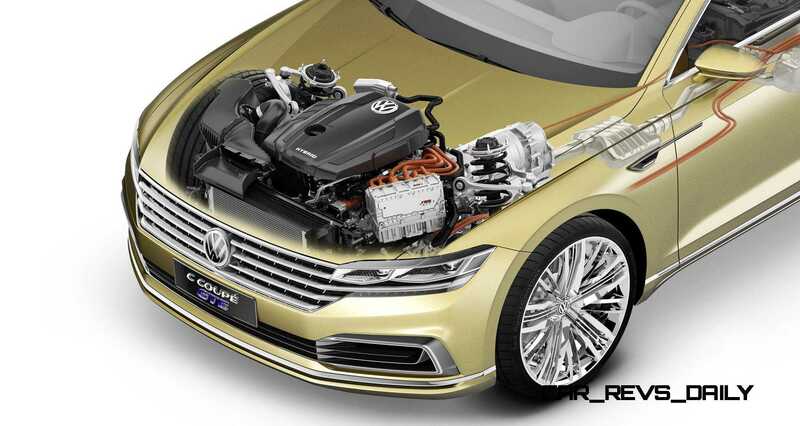 In an effort to establish the flagship and a failed attempt to earn US sales, the Phaeton was powered by a W8 or W12 gasoline engine in most trims, with a V6 petrol option the smallest power plant. 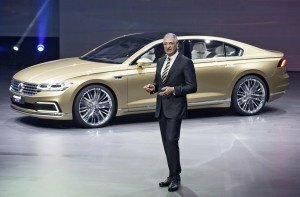 Diesel engines are offered in Germany, but the Chinese make diesel car sales prohibitively expensive. Tax breaks for diesels in Europe are not mirrored whatsoever in the US and China. 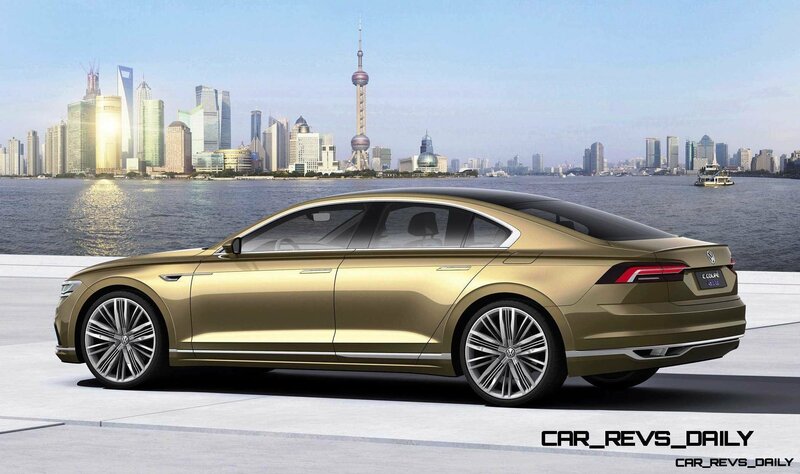 3 — the VW brand itself is the best-seller in China, but it is most certainly not a luxury brand. Most taxi’s are three or four-generation-old Jetta’s and Passats — making them ubiquitous and the opposite of exclusive. Times are changing under China’s President Xi however. A side-effort of the corruption and graft crackdown means that high-ranking Communist Party officials and all PLA military personnel are forbidden from putting government license plates on luxury cars. 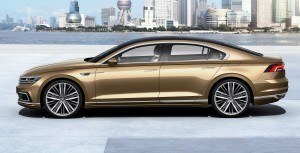 The new C Coupe GTE is a plug-on hybrid with a small four-cylinder gasoline engine up front, a big battery pack in back, and a cabin that is now ultra-modern with advanced technology. Longitudinal Engine + Front Drive = ?????? 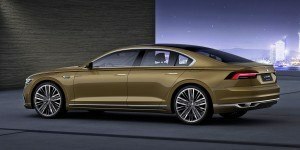 The proportions are better than the current Phaeton as a result of the W12 engine no longer needing to fit up front. 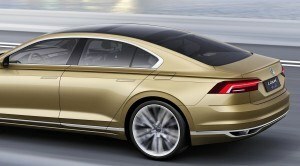 The W8 was huge too — causing the big overhang-design that still mars the big VW and Bentley Continentals. Removing that boat anchor up front let VW team’s push the front wheels forward dramatically. This chassis design for the engine is pretty odd, mind you. 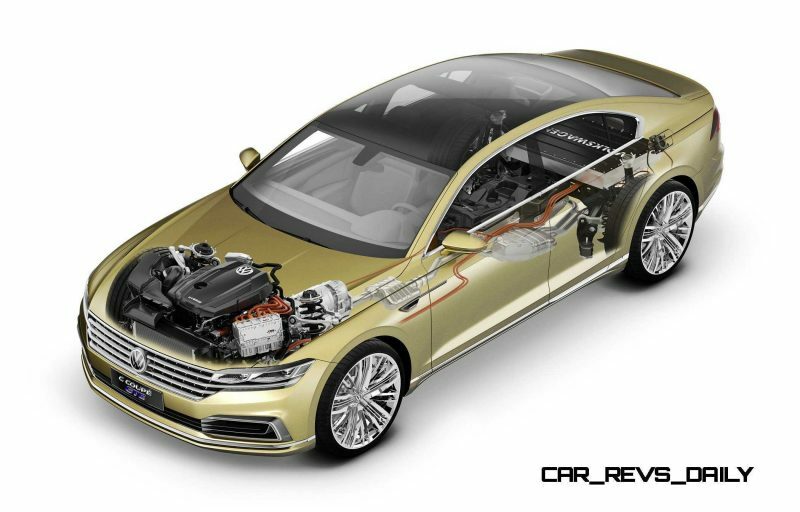 The 2.0-liter engine is not the typical transverse VW layout as on the current Phaeton, Continental, etc. It is more Panamera-like in being a longitudinal setup. This sends power into an 8-speed automatic with integrated hybrid assist. It sends all engine power up to the front wheels. 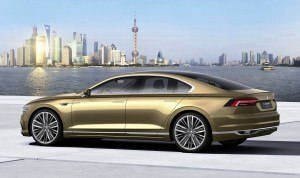 In this way, it is a bit like a steel (vs alloy) Audi A8 more than a VW-badged Panamera. VW Limo + Coupe Style = BMW-fighter? The roofline is now much lower and sportier, with an overall cab-backward design that recalls true luxury limo’s. 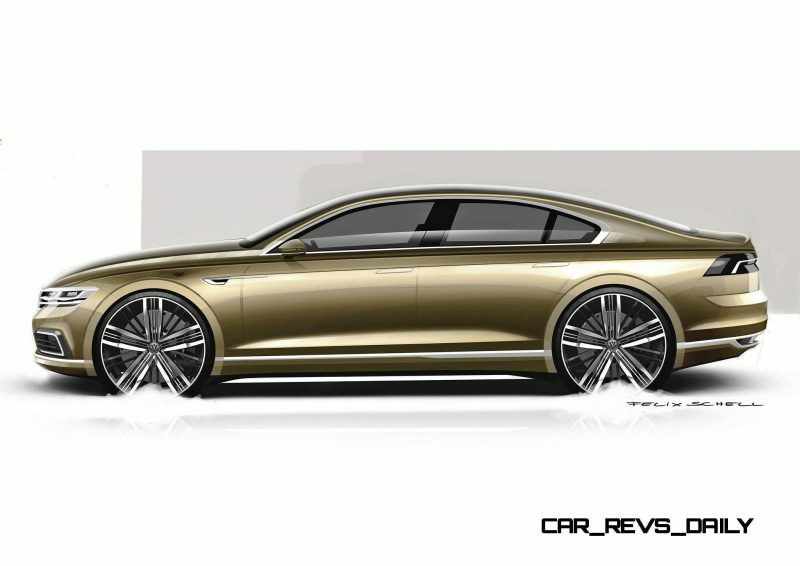 This C Concept GTE includes some interesting new design ideas, despite looking very blah from up front and back in these preview images. Real photos should show how dramatic the upper beltline crease is– this is a huge, sharp and deep stamp in the surfacing that runs from the front fenders all the way around the car and folding into the taillamps. It is the freshest part of the design overall, besides the newly-premium stance and proportions. 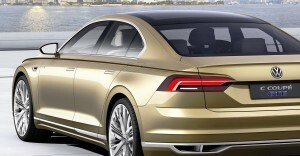 So, you might ask: why would VW even bother replacing the much-loathed Phaeton? The opportunity is clearly there to earn Chinese sales from wealthy people why are shy about showing their money off. These people are rapidly ditching any outward signs of their affluence to avoid seeming corrupt. 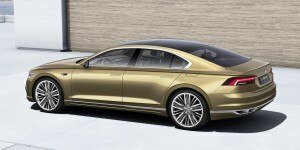 This makes a VW with S-Class-rivalling features, comfort and space seem like a good idea. 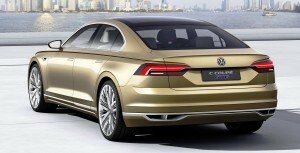 For many eyes, it will just look like a giant Passat. 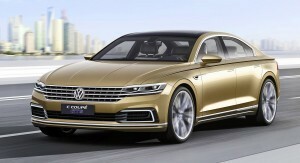 That will make the C Concept GTE another huge flop in the US market, but let’s keep moving forward. 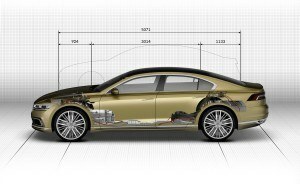 Secondly, VW needs a new Phaeton-size architecture to continue all the NVH and tech knowledge learned making the first Phaeton. 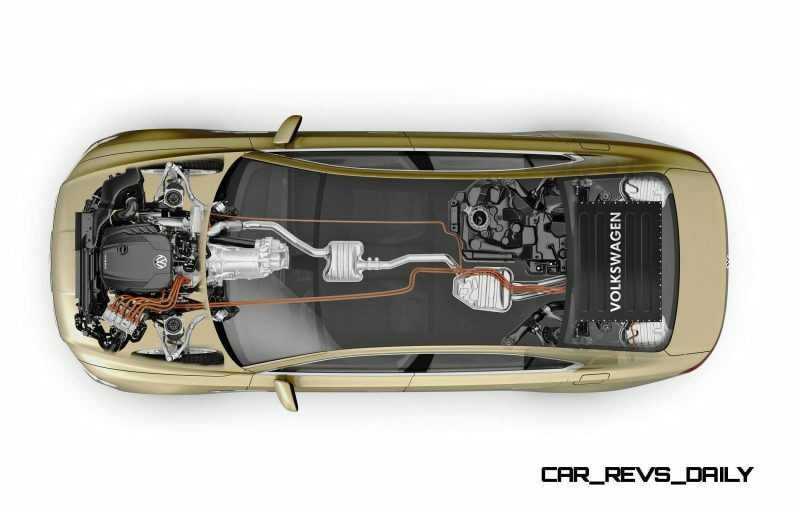 Much of that knowledge directly poured into the 2005-and-beyond Golfs, Passats and others — paying for the R&D efforts easily. 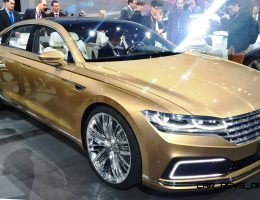 Thirdly, the Phaeton-sized VW is important as a glamour project for VW executive management, who are keen to do the heavy lifting and engineering on the next-gen Bentley Flying Spur in-house. 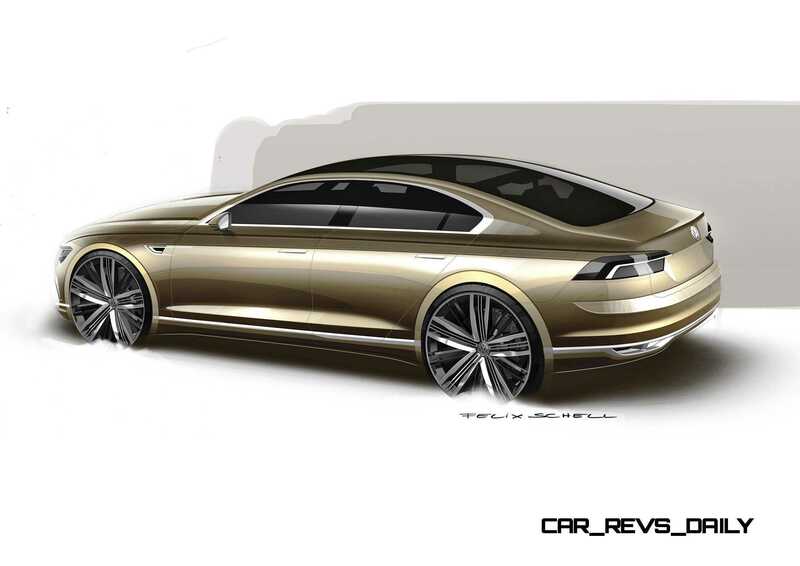 And away from Porsche, which may snag the next Continental platform-sharing assignment. 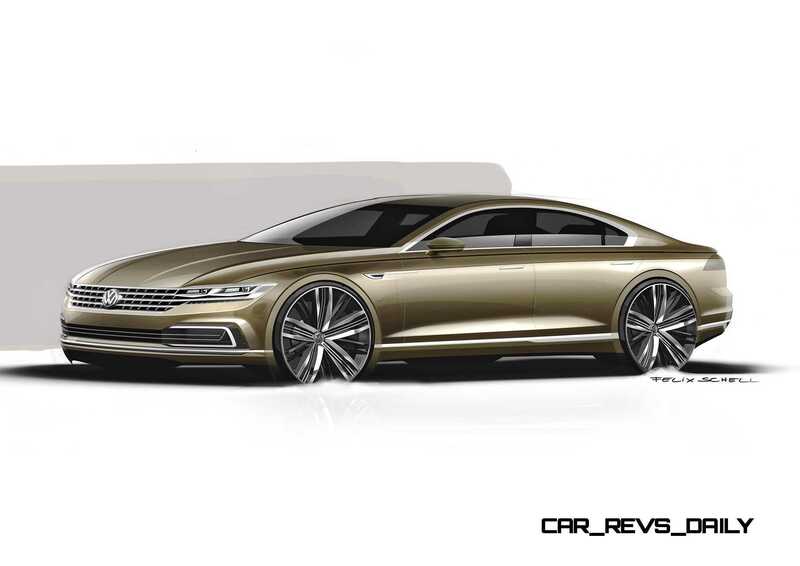 Will the C Concept GTE actually materialize and be for sale as a sort of Phaeton CC — a 4-door coupe-ish limo? Probably not. 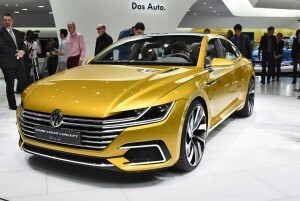 But it is important to show VW’s intentions to its most-important market recently: Asia. 9. Appointment schedule can be used by the chauffeur via the “Today’s Schedule” option for optimum route planning. 10. 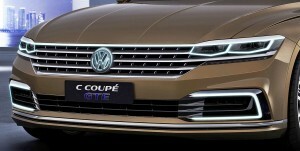 C Coupé GTE is the first Volkswagen to feature avant-garde exterior ambient lighting. System power 245 PS, fuel consumption 2.3 litres per 100 km. 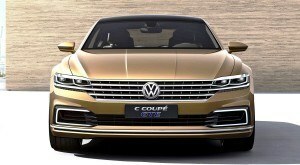 The C Coupé GTE presented at Auto Shanghai (20 to 29 April 2015) has one of the world’s most modern plug-in hybrid systems on board. It consists of a turbocharged direct injection petrol engine (TSI) with four cylinders, an 8-speed automatic gearbox, the electric motor integrated in the gearbox module and a lithium-ion battery. The TSI has a power output of 155 kW / 210 PS and the electric motor 91 kW / 124 PS. 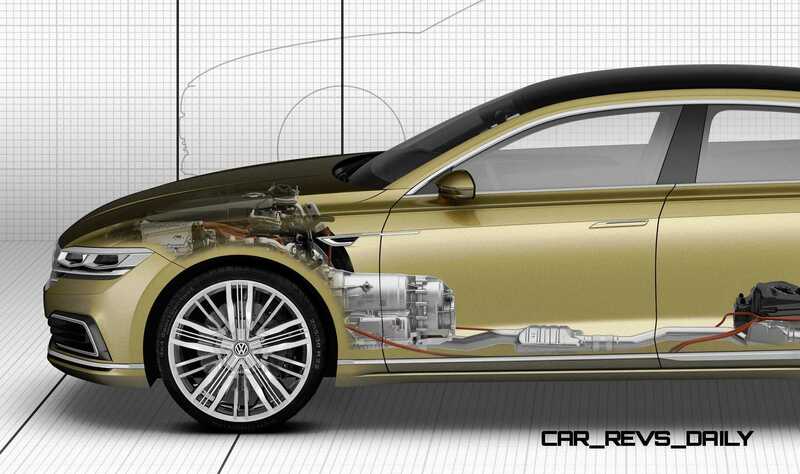 The battery integrated at the rear has energy content of 14.1 kWh. The hybrid drive develops 180 kW / 245 PS of system power and impressive system torque of 500 Nm. 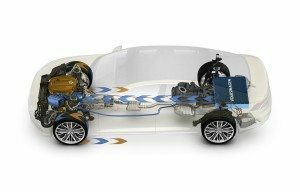 Thanks to the battery that can be charged both externally and whilst driving, the concept car can travel up to 50 kilometres powered purely by electricity i.e. without any local emissions. (Maximum speed in “E-Mode”: 130 km/h). It has combined fuel consumption (NEDC for plug-in hybrid vehicles) of 2.3 l/100 km; this corresponds to CO2 emissions of just 55 g/km. 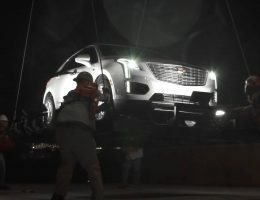 The vehicle has a total range of more than 1,100 kilometres. 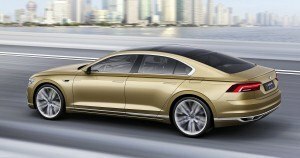 Despite being so efficient, the C Coupé GTE is an agile premium class model: the Volkswagen accelerates to 100 km/h in just 8.6 seconds and has a top speed of 232 km/h. The driver can choose between the operating modes “Hybrid”, “E-Mode”, “GTE” and “Battery Charge/Battery Hold”. Hybrid. The concept car starts by default in Hybrid mode. 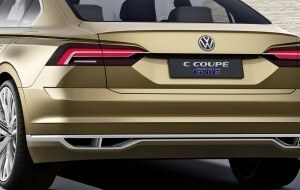 The C Coupé GTE is a full hybrid, which charges its battery via regenerative braking and automatically utilises the right combination of TSI and/or electric motor according to the specific driving situation. 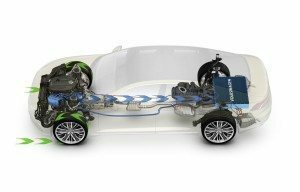 As soon as the driver releases the accelerator pedal, and the battery is sufficiently charged, all drive sources are shut off and decoupled from the drivetrain. This is a special form of “coasting”. Zero emissions are produced in this mode. If the driver decelerates the vehicle and the battery is insufficiently charged, the electric motor operates as a generator and feeds the energy recovered from braking into the lithium-ion battery. In this case, the TSI is also shut off and decoupled. E-Mode. In E-Mode, which the driver activates by pressing a button, only the electric motor provides propulsive power. 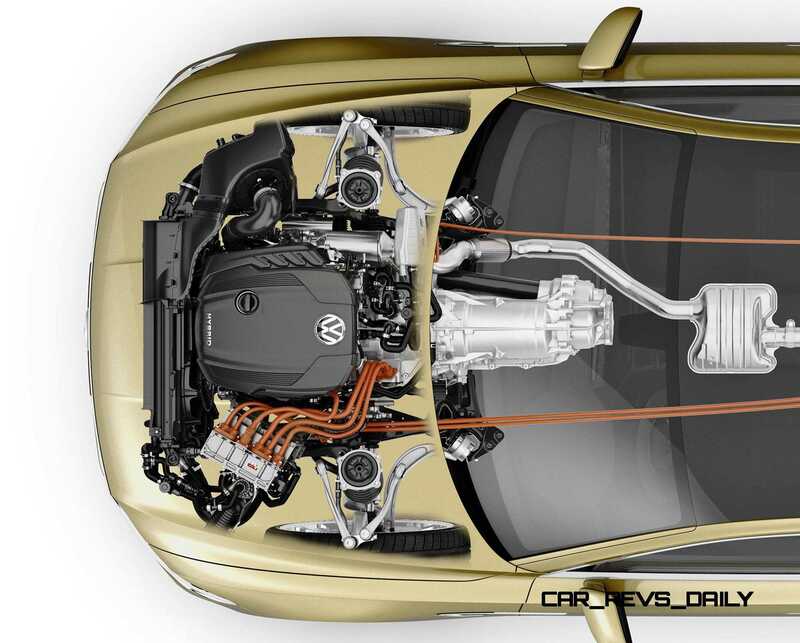 During electric driving, the TSI is decoupled from the drivetrain by disengaging the clutch, and it is shut off. As soon as the petrol engine needs to be used again – due to the battery’s charge state or other parameters – it is smoothly coupled to the drivetrain again within fractions of a second. The lithium-ion battery supplies the electric motor with energy. The power electronics integrated in the engine compartment manage the flow of high-voltage electricity to and from the battery and the electric motor. The vehicle’s 12-Volt electrical system is supplied with electricity via a DC/DC converter. GTE. The GTE button – positioned to the left of the gear lever like the E-Mode button – activates GTE mode, i.e. the particularly dynamic side of the concept car. The accelerator pedal, gearbox and steering characteristics are now even sportier. 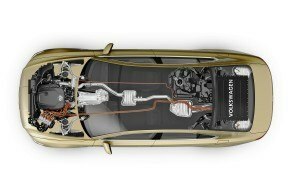 Furthermore, in GTE mode, the TSI and electric motor work together in ‘boosting’ which calls up the full system power and maximum system torque. Battery Charge/Battery Hold. The dual mode Battery Hold (battery’s energy content is kept constant) or “Battery Charge” (battery is charged while driving) is activated from a submenu of the infotainment system. This enables zero-emission driving in E‑Mode at the press of a button, for example in a city destination. Paying homage to the Chinese market. 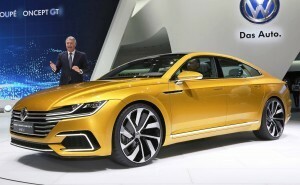 The concept car has the additional designation “Coupé” on account of its very long flowing C-pillars and boot section that taper towards the rear. This stylistic feature distinguishes the car from almost all other saloons in its class. The C Coupé GTE is painted in “Golden Atmosphere” – a colour that was chosen for a reason. 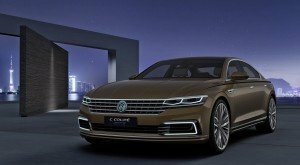 The background: not only does the concept car pave the way to the future of premium class Volkswagen models – it also pays homage to the Chinese market. And in China aspects such as wisdom and tolerance, patience and power are associated with the colour gold. The environmentally friendly drive system, the active and passive safety, the superior comfort and the look of the design are in tune with these parameters. Extremely sporty proportions. 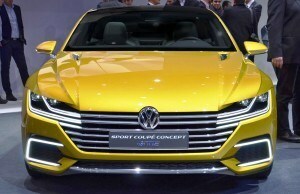 Like all new Volkswagens, this concept car is also characterised by extremely sporty proportions. Defining design traits include the striking long bonnet and – associated with this – the charismatic “prestige clearance”. This technical design term describes the distance between the front door shut line and the central point of the front axle. The greater this distance is, the longer the bonnet can be made without increasing the front overhang at the same time. This means that a long bonnet in combination with a short front overhang results in a particularly powerful and elegant premium-class design. 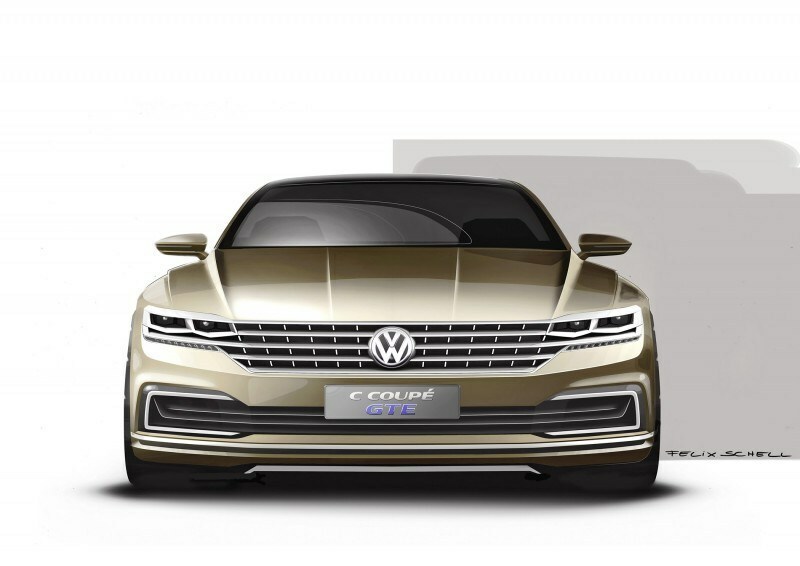 As the C Coupé GTE presented in Shanghai is the first Volkswagen to be based on the new modular longitudinal matrix, the designers were able to further perfect this concept. 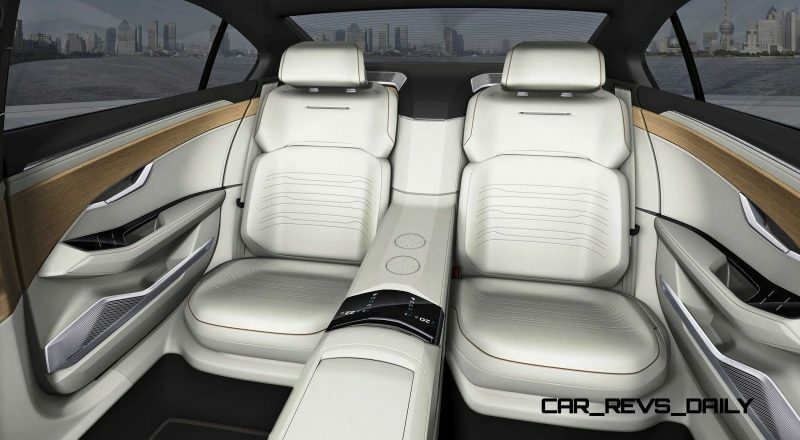 In conjunction with the passenger compartment that is both low and elongated, this results in an unparalleled powerful and yet elegantly flowing design for a new kind of sports saloon. More than five metres in length. 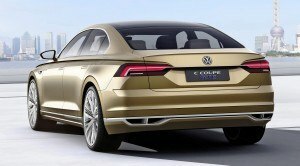 In fact, the C Coupé GTE is 5,071 mm long, an impressive 1,930 mm wide and 1,445 mm high. Between the front overhang that is rather short for a car of this size (924 mm) and the rear overhang (1,133 mm) the concept car sports a long wheelbase (3,014 mm). The wheel hubs of the completely redesigned 22-inch rims fitted with 265/30 tyres are situated at the intersecting points of the wheelbase and the overhangs. The large track widths of 1,634 mm (front) and 1,624 mm (rear) are in line with this powerful look. As a matter of fact, the car’s proportions with the striking ratio between length, width and height give the C Coupé GTE an eye-catching sporty and exclusive appearance in combination with the large wheels. Front end design. The striking proportions form a stylish whole with the charismatic design of the concept car. Horizontal lines and sharp, precise edges are the dominant elements structuring the vehicle. A defining and distinctive feature at the front of the car is the radiator grille with five chrome bars. The top and middle bars partly frame the LED dual headlights integrated in the three-dimensional look of the grille and extend to the wings. A second large air inlet is integrated in the lower section of the bumper and framed on each side by the C-shaped LED daytime running lights – a typical distinguishing feature of every Volkswagen with electric or plug-in hybrid drive. Below it is a chrome strip running across the whole width of the car; this chrome element is taken up again in the side view and the rear. Exterior ambient lighting. 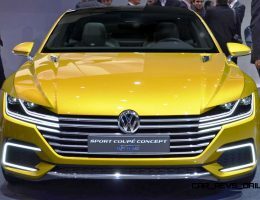 Not only has the Volkswagen Design team given the usual headlights and other lights a particularly charismatic look on the C Coupé GTE but also realised exterior ambient lighting for the first time. 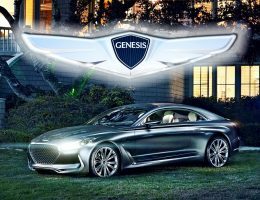 When the car is unlocked – either by remote control or keyless entry – an elegant and dynamic lighting display is activated. Side design. From the side, the character line formed by two lines catches the eye – a striking line as if cut by a knife on two levels that starts in the front wing and extends all the way to the boot lid. A pronounced powerful double shoulder develops from this double character line, also on two levels. 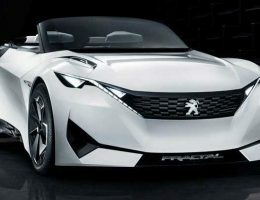 In the top area it extends elegantly across the whole vehicle; in the lower area it clearly has more of a wedge shape, emphasising the sportiness of the concept car. The glass roof section including side window line connects above the double shoulder. The windows are framed by a chrome frame whilst the doors themselves are frameless. The coupé-like design of the C-pillar is a striking feature: the chrome frame around the side windows ends with a counter curve in this roof pillar, which itself merges seamlessly into the short boot lid. Below the two character lines, in the powerful side of the vehicle that is characterised by alternating convex and concave surfaces, the large, striking and softly-shaped wheel arches catch the eye. 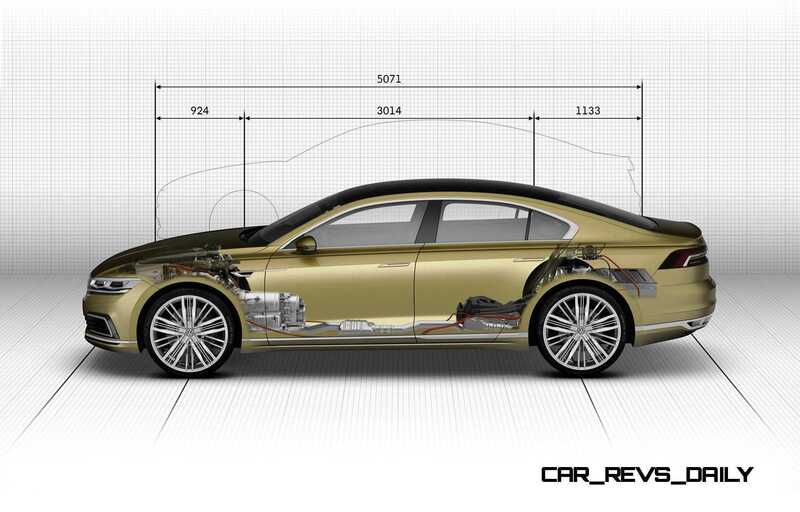 They extend a long way up into the vehicle body and give the concept car a very muscular look from all perspectives. Rear end design. 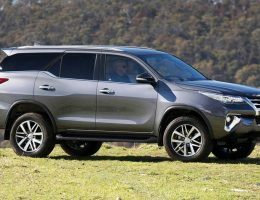 At the rear it is once again a horizontal surface structure that dominates the design and emphasises the width of the vehicle. The character lines that go all the way round to the boot lid frame the LED rear lights at the top. In the middle the lights feature a light-coloured band that also contains the ambient lighting. Like at the front and the sides, the rear section is also rounded off at the bottom by a chrome strip. This chrome strip is relatively flat at the front and the sides (up to the B-pillar). 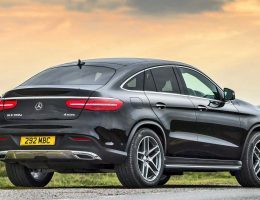 From the rear doors it gains in volume as it ascends, and at the rear it then expressively integrates the dual tailpipes of the exhaust system. This chrome trim strip, designed as an independent design element, seamlessly connects the side sections and the rear section with one another. 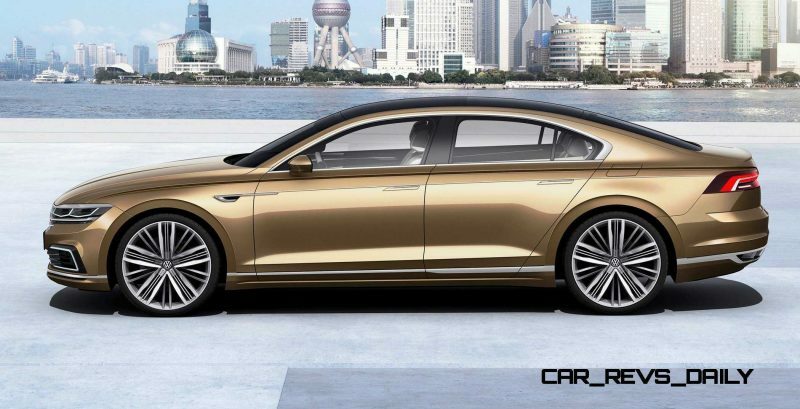 Sports saloon and chauffeur car in one. 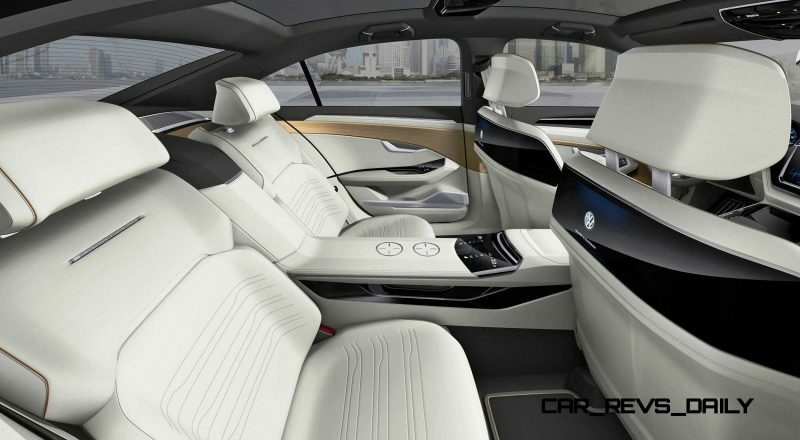 The interior, which features wrap-around ambient lighting, has an extremely elegant look. 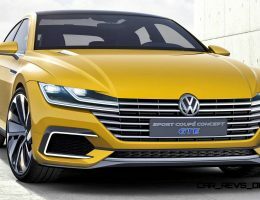 The C Coupé GTE has been designed as a sporty four-seater car to appeal to keen owner-drivers on the one hand whilst also being an ideal chauffeur car. In the driver area, the dash panel and the interior architecture have therefore been designed with a focus on the technical concept and on dynamic performance aspects. 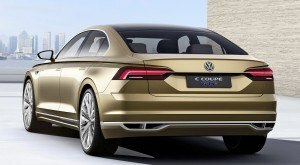 By contrast, the design team gave the rear a lounge character. The C Coupé GTE boasts an interior length of 1,882 mm – resulting in lots of space for the rear passengers. Chauffeur mode. The infotainment concept also follows this idea. 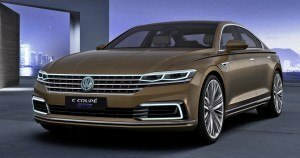 Here, Volkswagen has developed a chauffeur mode where information relevant for the driver about the manager’s appointments can be transferred via a smartphone to the infotainment system. This means that the chauffeur has a chronological list of appointments specially tailored to his tasks and is able to provide his boss with further information upon reaching the destination, for example the floor and room of the appointment. Parallel to this, the appointment list also serves to plan the navigation route for the day. However, the chauffeur does not have all the information in the appointment schedule but rather specifically filtered information for the infotainment system to facilitate punctual arrival at the destination. Last but not least, the last part of the route to be covered on foot can be transmitted to the passenger’s smartphone as “Last Mile Navigation”. Dash panel. The architecture of the dash panel – that comes in an anthracite basic colour (“Blizzard Grey”) – has a consistent horizontal structure. Below the air vents there is a Damascus steel trim – produced in a highly demanding craftsmanship process. To make a part in Damascus steel, several layers of steel are placed on top of one another and forged together again. Subsequent crosswise or lengthwise separation of the layers enables a specific pattern to be created, which is given a clear structure with grinding and polishing. Running parallel with the narrow line of the ambient lighting, this trim also frames the instruments and is taken up again in the door trim panels. The door panels are refined by wood trim following their shape which lends the highly technical interior a warm, natural atmosphere. A clock with an analogue appearance is integrated in the middle of the instruments. Further information synchronised with the infotainment content and also information on the vehicle status and the assistance systems can be displayed on this multifunctional smart clock. A further important function is the visual display of an interior air purification system (air quality index). A high-gloss black trim element underlines the technical character of the dash panel. The infotainment system and the digital instrument cluster (Active Info Display) are seamlessly integrated here. This trim element, too, are taken up again in the door panels where it extends all the way to the B-pillars. Infotainment system. The 12.3-inch touchscreen of the central infotainment system is extremely large. The display with its high-definition resolution is not a solitary display element but rather a sculptural part of the interior architecture. In the “Today’s Schedule” menu the driver can call up the (filtered) information relevant for him about the appointments of his rear passenger that were synchronised with the navigation system. The touchscreen is a large black panel display that is also the interface for the climate control. Active Info Display. The instrument cluster is a newly designed Active Info Display in high-definition resolution with 3D visual effect. The display has a 12.3-inch screen diagonal and was designed in such a way that the edges of the virtual space blend into the real border of the instrument cluster – this is done by an ambient light with a three-dimensional effect. Thus, no bordered black panel display is visible; rather one sees a free-form surface, which structures the three-dimensional space without perceptible borders by means of lighting effects. This attains a previously unknown high level of sophistication. In its basic configuration, the digital instrument depicts two round instruments; on the left there is the power meter, on the right the speedometer. A wide variety of information can be displayed between these two instruments, for example a playlist, current vehicle data and the map of the navigation system. A realistic 3D display of striking or well-known buildings (landmarks) in navigation mode is particularly helpful for orientation. The new free-form surface makes the round instruments appear to hover in virtual space. The graphics of the displays change according to the driving mode (E-Mode or GTE mode). Front centre console. 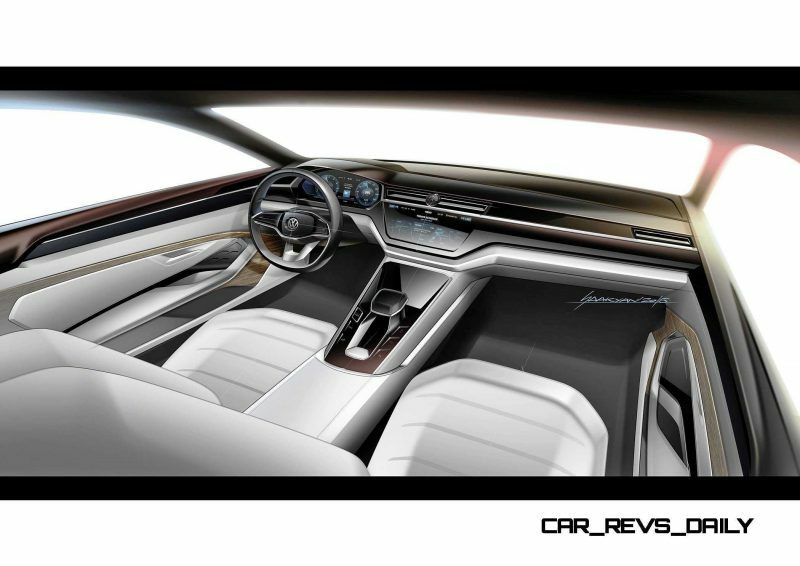 The concept car features a continuous centre console. Between the front seats near the selector lever it ascends towards the infotainment system. The selector lever for the 8-speed automatic gearbox – arranged on two domes in the left area of the centre console – appears to float. The selector lever is equipped with a shift-by-wire control logic: like a joystick, the lever is always in a central middle position; a short push activates R, N and D. The driver selects the P position with a separate button that is integrated in the selector lever. Rear. A look at the rear, fitted with two individual seats, immediately shows that the most important passenger sits in the back of the C Coupé GTE. 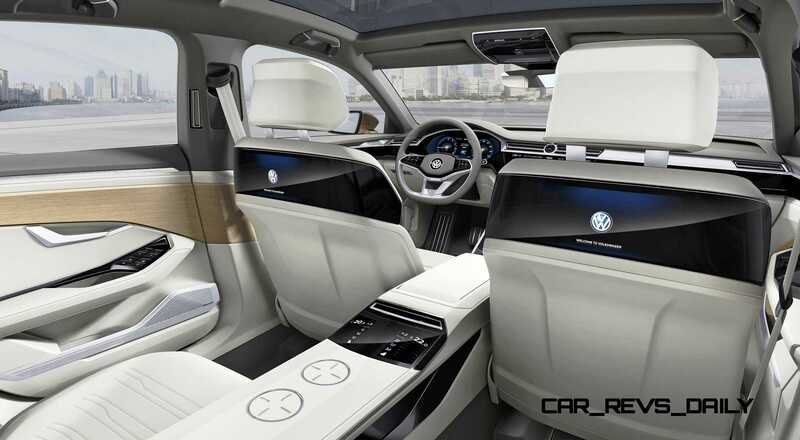 In terms of form, the whole design of the rear is therefore in keeping with the concept of a chauffeur vehicle. Whilst, as described, the design of the driver area has a very technical focus, the rear of the interior is characterised by a very homely atmosphere. It therefore features a higher proportion of materials such as wood and leather, creating a kind of lounge atmosphere. The door panels with wooden elements following their shape – at the rear reaching to the B-pillars and much larger and higher than at the front – create a cocoon-like feeling. The shape of the wood, the trim elements and the wrap-around ambient lighting visually connect the rear and the driver’s area with each other. Touch panels. There are two personal touchscreens (4.5 inch) in the centre console between the rear seats which are used for individual seat position adjustment and climate control for the left and right area at the rear. The rear passengers use a mobile media control unit – such as a smartphone or a tablet – to control the two screens anchored in the backrests of the front seats (each 9.5 inch). These displays are part of a black panel display application that extends across the whole width of the backrest. Functions such as operating the 600-watt Dynaudio sound system are also controlled interactively via the media control unit. Classy: the Dynaudio loudspeakers in the doors featuring aluminium trims as design elements (at the front and rear) that extend across the whole panel and emphasise the length of the doors. Important for privacy in the rear: along with buttons for the electric windows, buttons are also integrated in the doors for operating the side blinds and for infinitely variable darkening of the panoramic sliding roof; the otherwise transparent roof is darkened with an electrochromic foil integrated in the “switchable” glass. A high-gloss black “comfort traverse” as a roof console houses two folding vanity mirrors and an illuminated surface. Refreshing drinks are easily accessible between the rear seats in a cooled champagne box.